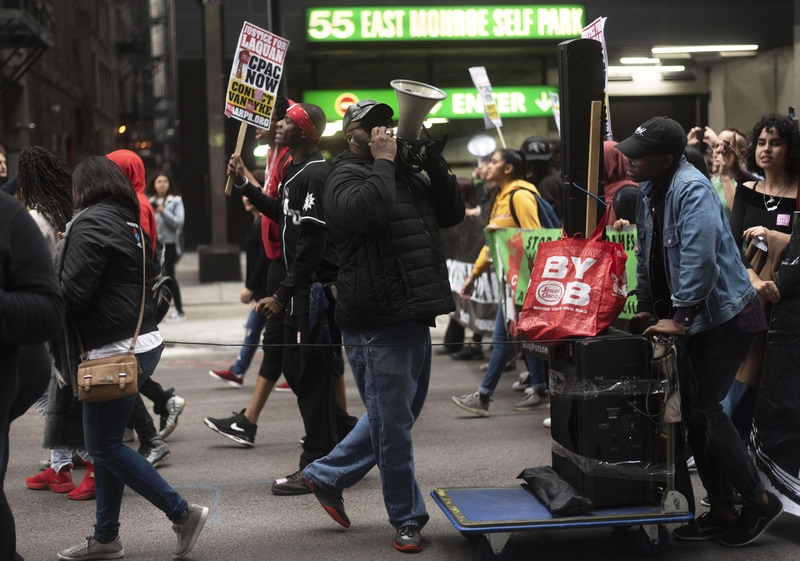 Update: On January 18, 2019, Jason Van Dyke was sentenced to 81 months in prison for the second-degree murder of Laquan McDonald. The sentence amounts to 6.75 years, with the a minimum of 3.5 served for good behavior. Van Dyke must serve two years probation after the sentence is complete. The crowd was moving with conviction, so fast that blink and you might miss. 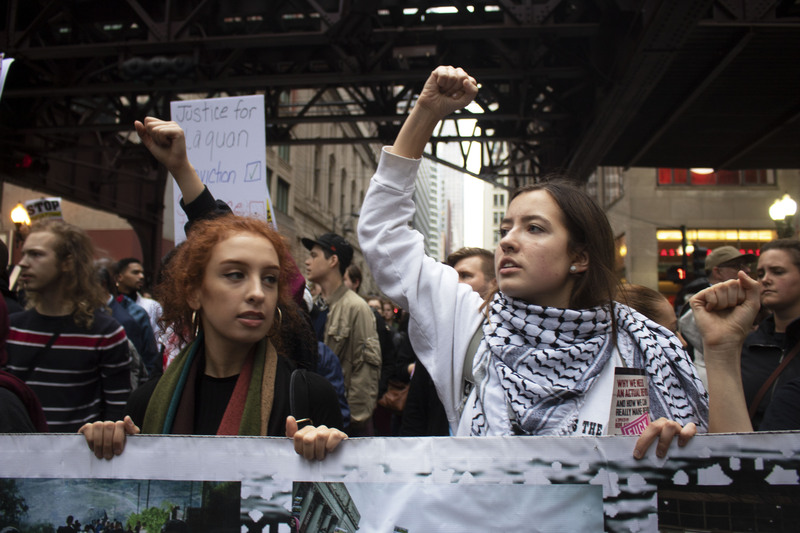 It ebbed and flowed, gaining momentum as protesters moved through downtown Chicago, from City Hall up to Trump Towers and down Michigan Ave.’s Magnificent Mile. The day was grey, sticky and thick, the morning’s rain evaporating off the city concrete, but the atmosphere was one of action, relief, grieving and change. As they moved, they chanted. 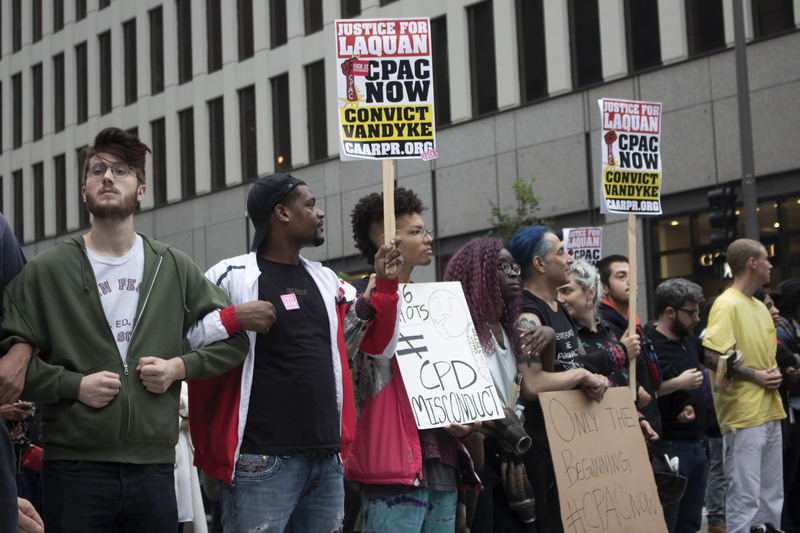 Almost four years after the death of 17-year-old Laquan McDonald, Chicago police officer Jason Van Dyke was convicted of second-degree murder on Friday, October 5. McDonald would have been 21 this year. Van Dyke was also convicted of aggravated battery for shot one. Aggravated battery for shot two. Aggravated battery for shot three. Aggravated battery for shot four. Aggravated battery for shot five. Aggravated battery for shot six. Aggravated battery for shot seven. Aggravated battery for shot eight. Aggravated battery for shot nine. Aggravated battery for shot ten. Aggravated battery for shot eleven. Aggravated battery for shot twelve. Aggravated battery for shot thirteen. Aggravated battery for shot fourteen. Aggravated battery for shot fifteen. Aggravated battery for shot sixteen. 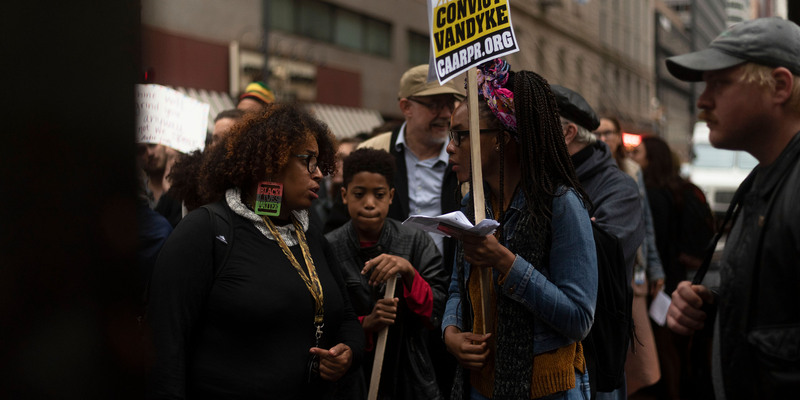 Van Dyke was acquitted of only one account, official misconduct. Van Dyke is the first Chicago police officer in 50 years to be found guilty of murder for an on-duty shooting. The trial began on September 17 and went to the jury on Thursday, October 3. The jury deliberated for about seven and a half hours over a two-day span, with the official verdict publicly announced at 1:45 p.m on Friday. Van Dyke will face a minimum of six years in prison. 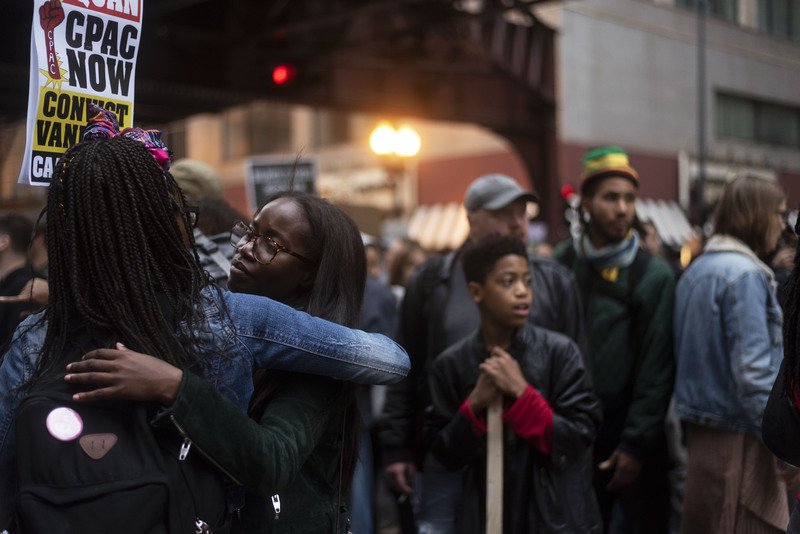 The verdict came after a long, three-year reckoning of police violence that exposed racial tension and prejudice between the Chicago Police Department and members of the Chicago’s Black and Brown community. 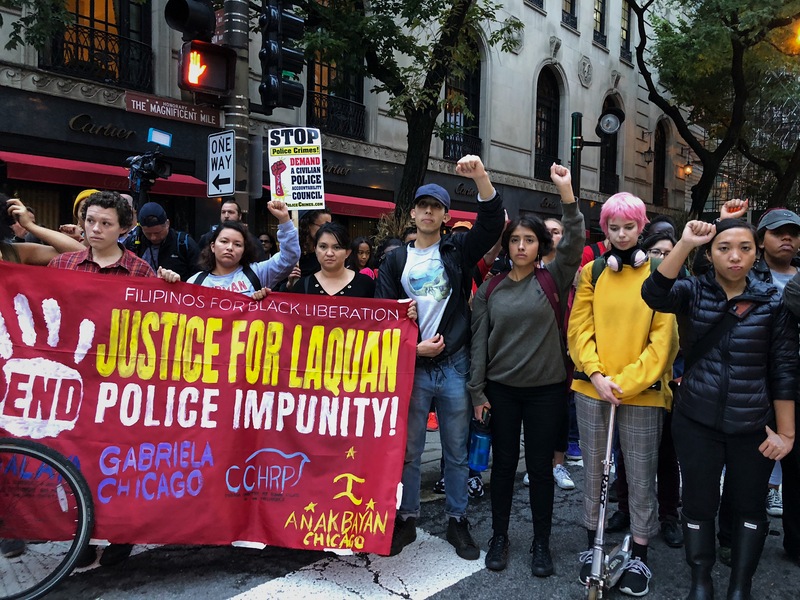 What resulted was the 2015 release of the dashboard camera video of the shooting, the creation of the Chicago Police Accountability Task Force, the firing of CPD Superintendent Garry McCarthy and Cook County State Attorney Anita Alvarez’s 2016 reelection loss. Activists, community members and protesters started to congregate outside Leighton Criminal Courthouse where the trial was held and downtown at City Hall. There was silence for the verdict, then movement. Photos by Cody Corrall, Madeline Happold and Mikayla Rose Price, 14 East. 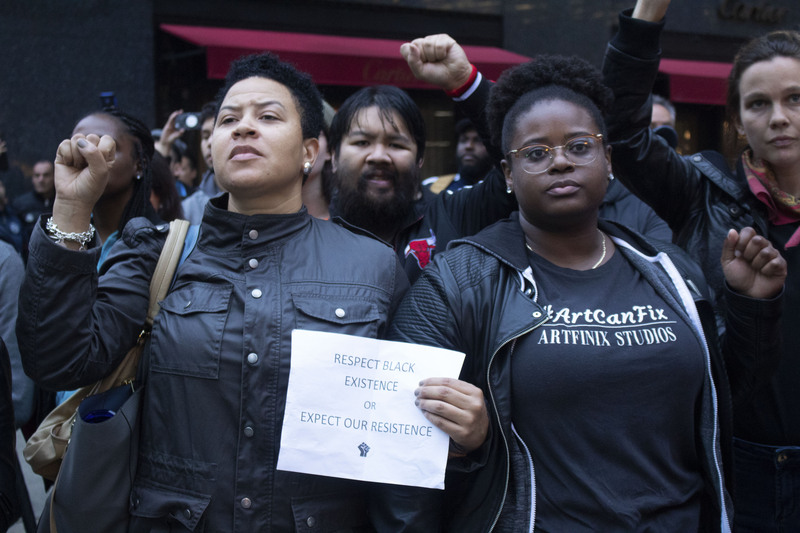 The protest quickly gained momentum and participants. 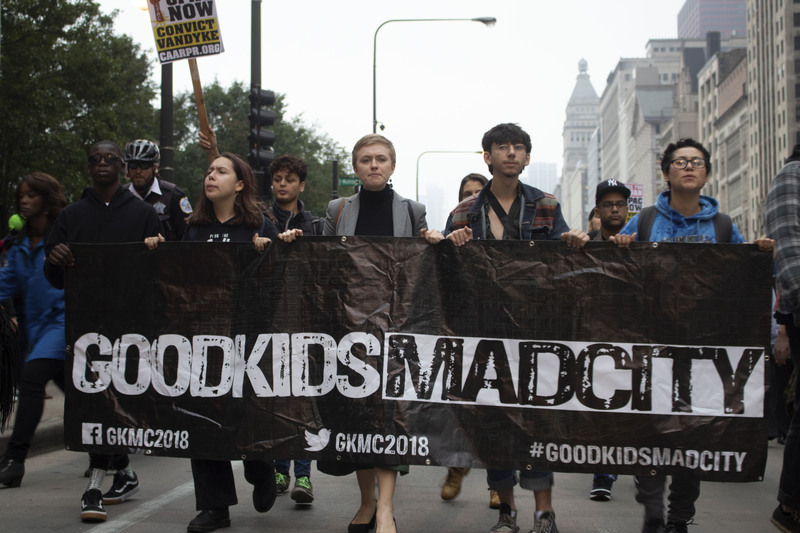 What started with about 200 participants grew to include members young and old, Black Lives Matter activists, Chicago Police Accountability Council (CPAC) supporters, Good Kids Mad City organizers and DePaul students. Some people urged others to walk along. “Join us!” they shouted at those watching from the sidewalk, waiting for buses that were sure to be delayed. As the crowd moved, stalled cars and buses honked in solidarity. Overhead, a Brown Line ‘L’ car did the same, with a smiling conductor waving to the crowd. Occasionally, the crowd was halted by CPD officers on bicycles, forming barricades between the crowd and Millenium Park. 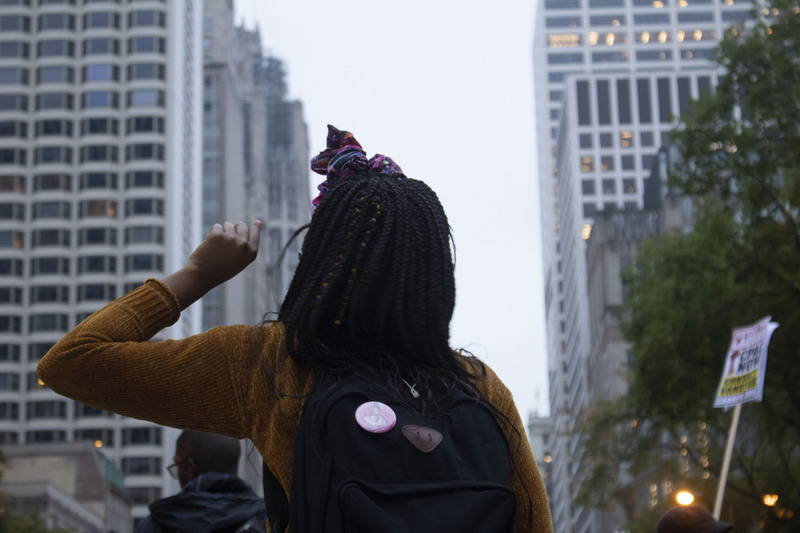 The crowd stood firm before continuing north, occupying the six lane stretch of Michigan Ave.
A green line conductor waves at protestors marching down Monroe St. Video by Madeline Happold, 14 East. The crowd paused in front of Trump Towers, some chanting to march to the polls for midterm elections and exercising the right to vote. Some extended their middle fingers towards the building. A smaller group huddled in the center of the crowd, hugging and taking a moment to pray. But, instead of continuing on towards Wabash, the crowd instead pivoted and returned to the Mag Mile, descending back down to Ontario St. They stopped again. 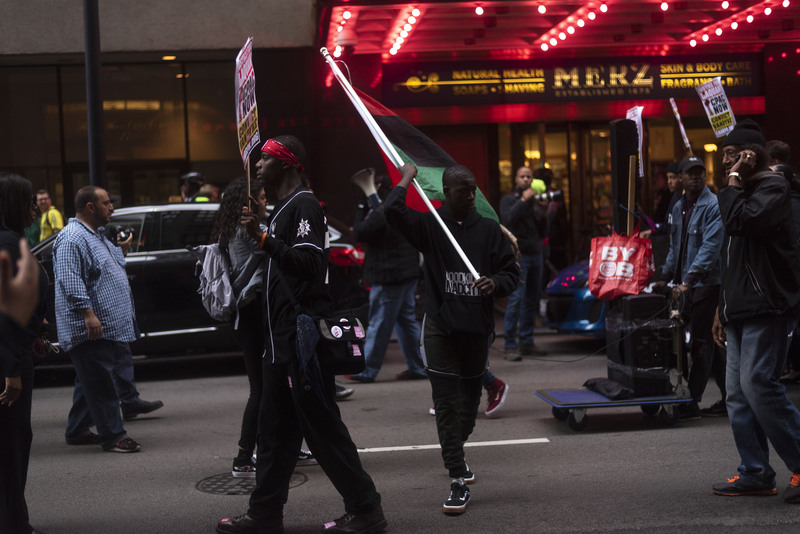 Organizers of the original Black Friday protest in 2015 — when protesters and activists first occupied the Mag Mile intersection on Friday, November 27, chanting “16 Shots” through the commercial streets — were called to the center. Protesters united in a circle encompassing the intersection, linking arm in arm. Cheering with organizers, holding fists in the air for solidarity. Blocking the city out. 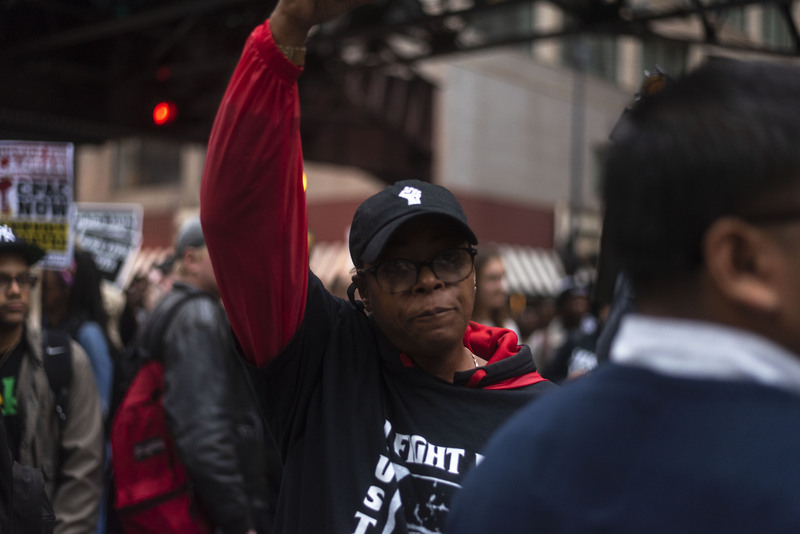 Organizers called for union between the city’s neighborhoods, police accountability, voter turnout and justice not only for McDonald, but other victims of gun violence who do not receive legal justice. The arms were slowly released as the crowd hugged, chatted and laughed, illuminated by street lights flickering on overhead. 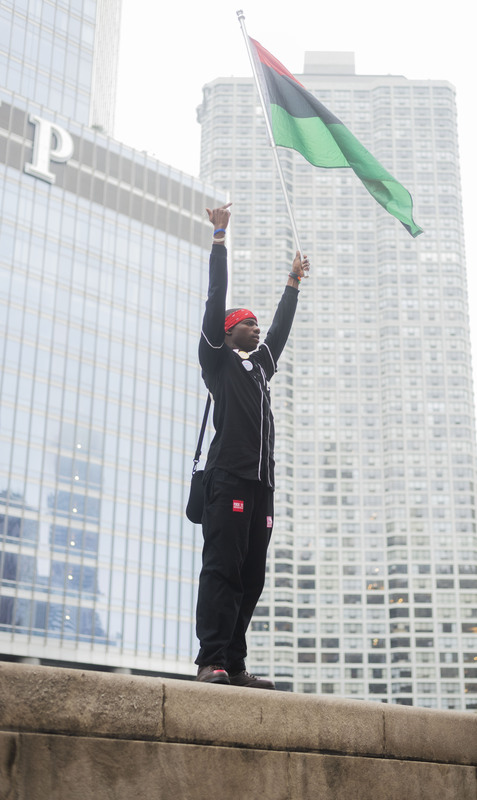 The protest parted by thinking forward: This is not the end, but just the beginning. Additional reporting by Christopher Silber, Cody Corrall and Mikayla Rose Price.